Home » emmy awards , filmmaking , moonshine , neal hutcheson , popcorn sutton , the last one » Popcorn Sutton documentary THE LAST ONE wins Emmy! 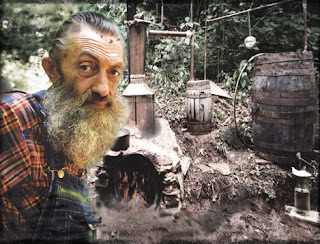 Popcorn Sutton documentary THE LAST ONE wins Emmy! This past Saturday was a big night for North Carolina filmmaker Neal Hutcheson! At the 35th Southeast Regional Emmy Awards held in Atlanta, Georgia, Hutcheson's documentary The Last One - in which he chronicled Marvin "Popcorn" Sutton's fine art of moonshining - won the Emmy from the National Academy of Television Arts & Sciences for "Outstanding Achievement in Television Programming Excellence". "Popcorn's death underscores the cultural preservation value of films like The Last One," Hutcheson said. "A fact that I doubt escaped the Emmy selection committee." I have a copy of The Last One on DVD and y'all wouldn't believe how big in demand it has become around where I live: I don't know if there's a house in the neighborhood that hasn't watched it at least once! It is an exceptionally fine film and that it has been so honored is a testament to both its maker and its subject. For more about The Last One, visit the website for Sucker Punch Pictures. UNC-TV has been showing The Last One quite a bit over the past few months, so one way or another you're likely to have a chance to see it. I was so glad to happen apon this doc. last night on PBS. I knew nothing about Popcorn untill then. I've always known about moonshine from my dad as he used to drop off sugar to the shinners in the hills of Ky. and Tenn. He would drop off the sugar when there was no one around and it would be gone as he passed back by. This was in the Rock Creek area just out of the Hayes Creek valley Ky.